ST. THOMAS, U.S. Virgin Islands – A 17-2 run to end the first half propelled No. 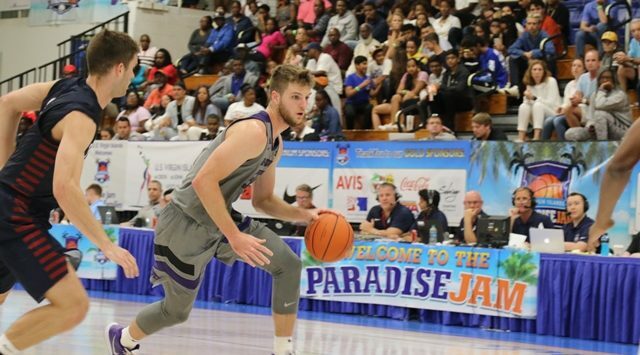 12/11 Kansas State past reigning Ivy League champion Penn, 64-48, on Sunday night in front of 2,460 fans at the UVI Sports & Fitness Center to advance to the championship game of the U.S. Virgin Islands Paradise Jam. K-State (4-0) will meet former conference rival Missouri (3-1), a 69-63 winner over Oregon State (3-1) in the first semifinal matchup, in the championship game at 6:30 p.m., CT on Monday night. 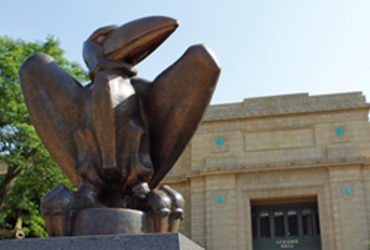 It will be the 237th meeting between the two schools in a series that dates all the way back to 1907. The schools last met in 2015. Penn (4-1) will face Oregon State in the third-place game at 4 p.m., CT, also on Monday. Down 19-11 with 7:16 remaining in the first half, the Wildcats finally got their offense going, as seniors Dean Wade and Barry Brown, Jr., scored on back-to-back possessions that cut the deficit and helped ignite the 17-2 run. After a lay-up by Penn’s Devon Goodman that extended the lead to 21-15 with 4:59 to play, K-State scored 13 consecutive points to end the last 4:37 of the half and take a 28-21 lead into break. The Quakers closed to within 46-40 on a jumper by junior A.J. Brodeur with 9:10 remaining, however, the Wildcats scored six straight points en route to ending the game on a 18-8 run. K-State connected on 42.1 percent (24-of-57) from the field, including 50 percent (14-of-28) in the second half, while Penn shot just 30.6 percent (15-of-49), including 28.6 percent (6-of-21) after halftime. The Wildcats scored 20 or more points off turnovers for the fourth consecutive game with 22 points on 19 Quaker turnovers. Senior Dean Wade paced three players in double figures with 17 points on 7-of-15 shooting to go with a game-tying 8 rebounds and 4 assists in 35 minutes, while fellow senior Kamau Stokes and junior Xavier Sneed added 16 and 11 points, respectively. Junior Makol Mawien chipped in 5 points, 8 rebounds and a career-best 4 blocks. Goodman led all scorers with 18 points, including 14 in the second half, while freshman Michael Wang added 12 points off the bench. Stokes opened the game with a 3-pointer from the top of the key to start the K-State scoring, but a span of just one made field goal in a stretch of 11 attempts kept the game in a back and forth pace. A Wade jumper gave the Wildcats a 10-9 lead at the 10:37 mark before the Quakers used a 10-1 run, including eight in a row after the Wade basket, to take a 19-11 advantage with 7:16 before half. Back-to-back baskets by Wade and Brown cut the deficit to 19-15 with 6:05 to play before a jumper Goodman extended the Penn lead to 21-15 at the 4:59 mark. On the next possession, a pair of free throws by Brown ignited a 13-0 run that gave K-State a 28-21 lead at halftime. Lay-ups by Brown and junior Austin Trice knotted the score at 21-all with 2:46 remaining before Wade scored 5 straight points, including an old-fashioned 3-point play, to extend the lead to 26-21 with 43 seconds. Sneed finished of the half with a tip-in off a Stokes miss just before the buzzer for the 28-21 lead. K-State connected on 34.5 percent (10-of-29) from the field, while Penn shot 32.1 percent (9-of-28). Wade led all scorers with 11 points on 4-of-7 shooting, while Brown added 7 points. Back-to-back 3-pointers from Goodman opened the second half to close the gap to 30-27 at the 18:15 mark before a quick 7-2 spurt gave the Wildcats with 37-29 advantage with 16:49 remaining. During the stretch, three different players (Brown, Stokes and Sneed) scored, including a 3-pointer by Stokes. A technical foul was called on both teams at the 12:14 mark, which ignited a 5-0 run by Penn that cut the deficit to 42-36 with a 11:01 to play. A 4-0 spurt by K-State pushed the lead back to 46-36 with 9:58 remaining. After a layup by Goodman and a jumper by Brodeur cut the lead to 46-40 with 9:10 to play, the Wildcats ran off six straight points on two Sneed free throws and consecutive baskets by Wade to again push it to double digits at 52-40 at the media timeout with 5:11 remaining. The lead never dipped under 10 points the rest of the way, as K-State out-scored Penn, 18-8, to earn fourth consecutive win of the season. The Wildcats connected on 50 percent of their field goals in the second half, including a 13-point effort by Stokes, who finished 5-of-7 in the half. Senior Dean Wade led the Wildcats in three categories, as he scored a team-high 17 points on 7-of-15 shooting to go with a team-tying 8 rebounds and a game-high 4 assists in 35 minutes. With his 3-assist effort in Friday’s win over Eastern Kentucky, he became the tallest player in school history to eclipse 200 career assists. 17-2 – Down 19-11 with 7:16 remaining the first half, Kansas State put together a 17-2 run, including 13 straight to end the half, to take a 28-21 lead into the break. The Wildcats never trailed the rest of the way.